Our charters provide fishing on the bayous of South Louisiana, just thirty minutes from New Orleans! Located just 19 miles from New Orleans, we are the only charters service offering guided sea plane trips to the Chandeleur Islands. Today Captain Poncho took Fire Fighers Travis Mc Williams and Ron Granger out fishing along with Rons two daughters Bethany and Hailey. They been down here since hurricane Katrina and took a day off from fire fighting to go RED FISH and SPECK fighting! They had a great day of fishing, and the girls did better than the guys! They Caught 17 REDS and 25 SPECKS!!! WOW!! 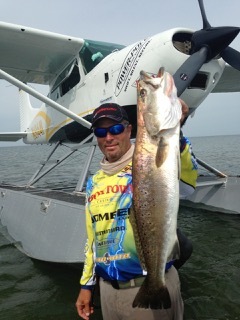 Captain Poncho really knows how to find those FISH!!! Mike Truxillo and his son Mike Jr. was in New Orleans and decided to take a father-son fishing trip with BOURGEOIS CHARTERS. They had a great day of fishing.Capt. Cricket really knos how to put them on those reds! Lil mike did such a great job he out fished his dad! WE ARE ADDING ANTOHER 4 ROOMS AT THE CAJUN VISTA AND NOW WE CAN ACCOMIDATE UP TO 50 PEOPLE!!! ALSO WE HAVE A MEETING ROOM THAT CAN ACCOMIDATE UP TO 60 PEOPLE!!! Saturday Mr. Conor and his two buddies came fishing out on the bayou with Bourgeois Charters... They caught a bunch of big reds and trout! Captain Pete sure knows where to find those fish! Johnathan Temple and his friend Mr. Stewart decied to take their sons Guyton Temple and John Mark Stewart out fishing with Bourgeois Charters. They had a great day of fishing and caught some big reds!!!! Capt Theophle took Buzz Livingston and his buddy Doug out fishing at the Cajun Chalet... the chef prepared for them some homemade gumbo, jambalaya, red beans and rice, potato Salad, fried fish, blackend red fish and for desert they had strawberry shortcake and red velvet cake!! They had a great stay along with a GREATT fishing trip they maxed out their limit on a three day posession of reds so decied to go fishing for trout and caught 75 of them!!! WOW NOW THATS WHAT YOU CALL FISHING!!!! FOR MORE REPORTS AND OTHER INFO YOU CAN CHECK OUT OUR WEBSITE AT... WWW.NEWORLEANSFISHING.COM OR YOU CAN CALL US AT 504-341-5614! Capt. Poncho took Laura Blake, her Mother, her brother Craig, and her friend Nick out the the Cajun Chalet...the chef prepared for them some homemade gumbo, jambalaya, red beans and rice, potato Salad, fried fish, blackend red fish and for desert they had strawberry shortcake and red velvet cake!! They had a wonderful time at the Cajun Chalet and had great time on their fishing trips!! Capt. Theophile took John Swanson his wife Allison and their buddy Jamie and his fiance Cathy out fishing on the bayou. This was their first trip to the marsh and capt. theophile showed them what the talk was all about!!! They caught over 50 specks and 8 reds!!!! They were ecstatic about the fishing and had a wonderful time!!! Capt. Theophile sure did put them on the fish!!! Gauran Desai and his son Sameer came out to fish with Capt. Mike... Gauran brought along with him his two buddies Sagan and Pramod. They had a great time fishing with capt. mike and caught lots of fish and Sameer caught his first red!! way to go sameer!!!! David Hensen and his son came out fishing with capt. poncho for their second time fishing with bourgeois charters... this time they brought along some buddies. they had a great fishing trip and really put a beating on those reds!! Neal Pike and his buddies came out fishing to celebrate a bachlor party. Capt cricket and Capt. Bobby took them out for a great time and put them right on those reds!! They had a great celebration while fishing with Bourgeois Charters! !